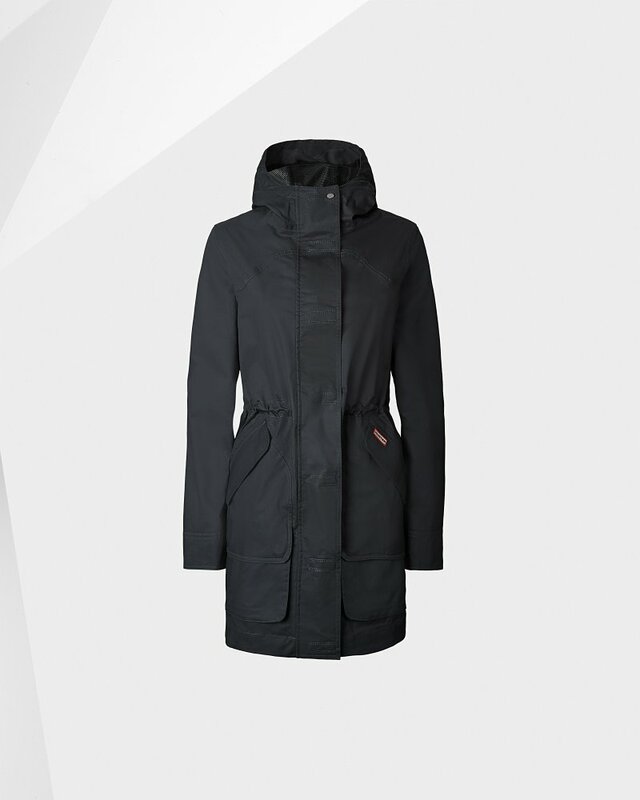 Women's Original Waterproof Cotton Hunting Coat is rated 4.4 out of 5 by 10. Rated 5 out of 5 by Sarah from Very Good Quality! I bought this coat a month ago and really love how it's both rain and wind proof! Great coat to layer during the spring/fall months or wear alone during warmer months. The zipper was a bit tricky at first, but it works very well after a couple of times of being used. Rated 3 out of 5 by Colourful Coats from Bizarre sizing ...gorgeous coat + 2-way zipper! Don’t know how to feel about this coat. It’s well-constructed, great fabric, beautiful colour ... but the sizing for this Medium coat is ridiculous. I have extremely long arms and have an ‘athletic pear’ shape :) NEVER do I find coats with sleeves almost too long or too full in the hips — until now. Hunter’s sizing chart suggested I need a Large but I went on reviews and got a Medium ... however, I’d really need a SMALL. Not going to bother exchanging. For reference: 32DDD (small rib cage and under bust area and this medium felt tight in the chest area). 31” waist, 41” hips. 5’7” height. I called customer service 4 times to ask if the coat has a 2-way zipper which is a must for any of my coats. I was told “no it does not” each time even though the photos of the black and navy coats show the zipper. One rep had me on hold for a long while and came back to tell me that “no women’s Hunter coats have 2-way zippers” — per his supervisor. Seriously!! 1 star for customer service 2 stars sizing issues 5 stars for the coat itself. Rated 5 out of 5 by Alimal from Best raing coat!!! I love this coat, i recomend this coat to my friend and she bought it too and she is in love with this coat too. And the color is so beautiful! Rated 5 out of 5 by Kayjay from Pretty color I purchased this jacket for rainy days. Its cute stylish and a nice fit!! !